NASA’s Curiosity rover has wandered around Mars’ Gale crater, a presumed ancient lakebed, since 2012. Part of its duties include sampling the dirt and the atmosphere for interesting molecules, like those that may reveal a history of life or habitability. The most recent studies, both published in Science, shed light on that history. 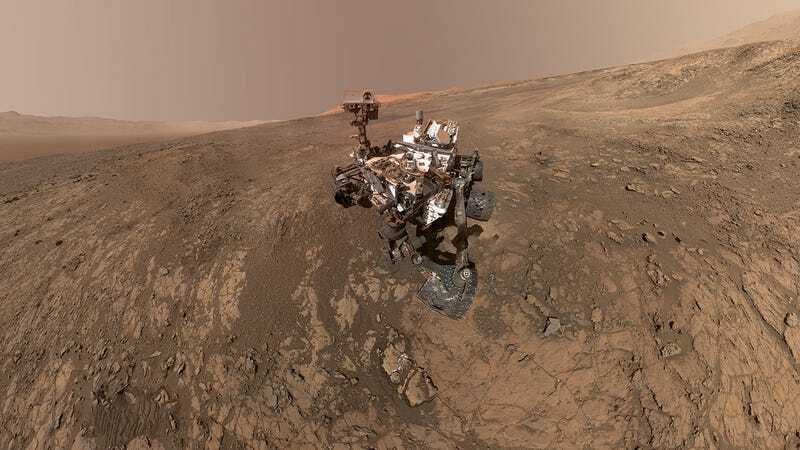 The rover’s Sample Analysis at Mars (SAM) instrument cooked some of the Martian dirt and unlocked some long-hidden carbon-containing molecules, some with sulfur and others with relatively complex structure. “Perhaps they were from life, or maybe there was just an additional nutrient here for life,” Eigenbrode said. Organic molecules pop up frequently in space, but it’s neat that Mars had life’s building blocks during a time when many think it was more habitable. On Earth, we have a process by which underwater volcanoes interact with rock, producing methane that feeds bacteria. Maybe there are subsurface Martian bacteria eating that methane, Tanya Harrison, director of research for Arizona State University’s Space Technology and Science (“NewSpace”) Initiative, told Gizmodo. But for now, there’s no evidence for any such bacteria. All of the outside sources I spoke with said it’s important to be skeptical about claims of life, extinct or otherwise, on the Red Planet. After all, these are just organic molecules on their own, so we’re still in the stage of chemistry, rather than biology. Plus, scientists don’t know what the original molecules were before Curiosity heated the rocks to take the measurement, Utrecht University scientist Inge Loes ten Kate, who was not involved with the research, told Gizmodo. There’s so much left to learn about Mars. The Insight and ExoMars missions will teach scientists more about the planet’s geology and methane. Mars2020 will shed light on the organic molecules—and prepare a sample that some future mission could bring back to Earth. Mars doesn’t recycle its rock the way that Earth does—maybe its ancient dust can teach us a thing or two about our own planet’s history, said Siebach.